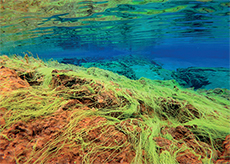 I can say it now: I can die happy tomorrow as I have dived Silfra! It was one of those dreams that you want to realise, but you think you’ll never do it and once you’re actually doing it, you are gobsmacked and you keep pinching yourself. TV. I have seen pictures of it in the National Geographic magazines, but I have to say, none of these actually pay it justice. 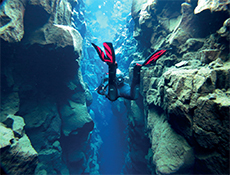 Silfra is the most exhilarating diving experience I have ever done. I got the chills not from the 2°C water but from the excitement and amazement of hovering through this place. and the definition reflects the colours of the water reflecting the sky. 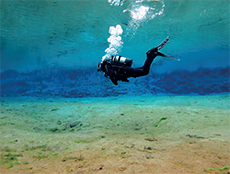 The water is so pure that divers (and snorkelers) experience 100 to 150 metres visibility which is completely disorientating from the surface. The effect is stunning. You lose your sense of distance and depth which can create a feeling of vertigo for those who have acrophobia. Some people have described it as diving in gin, it is like diving in gin, no exaggeration. match the reality and the beauty of this incredible place, especially in the midnight sun. in the north of the island (a five hour drive) where the minerals of the hot fresh water coming from 70m deep in the sea coagulate with the cold ocean water creating massive limestone chimneys. A very spooky dive where wolffish and monkfish will play hide and seek with you at depth. (Advanced Open Water Minimum). Iceland has a lot to offer and the reality of our living planet is unavoidable even from the shower of your hotel room where the hot water will have a tiny taste and smell of sulphur. In order to make your geothermal tour complete, you must finish your stay with a relaxing matinee at the Blue Lagoon where you can get pampered from head to toe. From whale watching to tectonic plate diving, Iceland is without doubt an island of wonders which will mesmerise you. Nature is at your feet even if sometimes it means you may end up with a pickled puffin in a jar for dinner. It is definitely the trip of a life time.